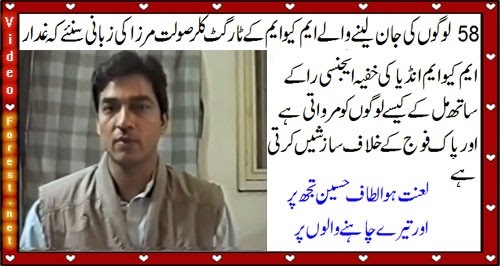 MQM target Killer Saulat Mirza confessing his crimes in front of investigation officer tells the truth about how MQM is involved in terrorism and have links to India and RAW. Mirza is a convicted target killer who committed 58 murders after being released on parole in 2004. Sindh Police officials claim Mirza belongs to the Muttahida Quami Movement (MQM) and is the only person convicted for Karachi’s target killings and was arrested for the July 1997 killing of the then MD of KESC Malik Shahid Hamid when he returned from Bangkok at the Karachi airport in December 1998. MQM denied that they not know who is Saulat Mirza but Mirza wife revealed that his husband was the party worker and target killer of MQM Pakistan. government issued the death warrants of Saulat Mirza and he will be hanged on March 19 at 5:30am in Machh Jail of Balochistan.